When Donald and Melania Trump requested a Vincent van Gogh painting from the Guggenheim, the museum responded with a counteroffer. Last year, Donald and Melania Trump asked the Guggenheim Museum if they could “borrow” a painting by Vincent van Gogh to hang in the White House, the Washington Post reports. The museum declined. 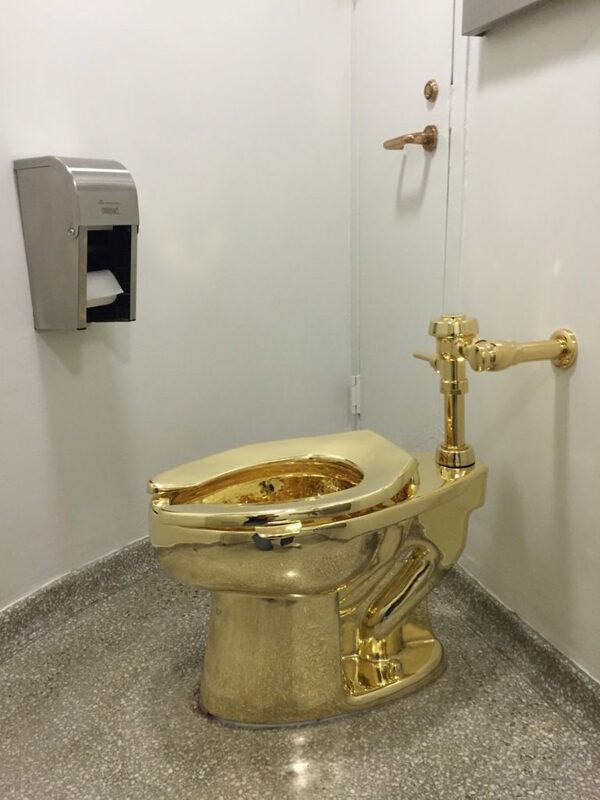 Instead, it offered Maurizio Cattelan’s “America”: a functioning toilet cast in 18-karat gold. The toilet had been installed on the museum’s fourth floor for one year,attracting hours-long lines and much fanfare. The toilet was deinstalled last September, around the time when curator Nancy Spector decided to respond to the President’s request. In an email sent on September 15 and obtained by the Washington Post, Spector wrote that Cattelan “would like to offer it [‘America’] to the White House for a long-term loan.” She elaborated, “It is, of course, extremely valuable and somewhat fragile, but we would provide all the instructions for its installation and care.” The email was addressed to Donna Hayashi Smith of the White House’s Office of the Curator. “It’s a very delicate subject,” Cattelan told the Washington Post, when asked about his offer to the Trumps. “What’s the point of our life? Everything seems absurd until we die and then it makes sense.” Spector declined to offer comment to theWashington Post, and the White House did not respond. One wonders if Cattelan and the museum took inspiration from the anonymous collective Art Finksters, who, on Trump’s 100th day in office, installed golden toilets around the United States bearing the message “Take a Trump!” and the image of a crown-wearing pig. Both projects share in their mockery of a gaudy, all-gold aesthetic that Trump seems quite fond of — from the gold plating on his airplane to the golden detailing outside his New York penthouse.